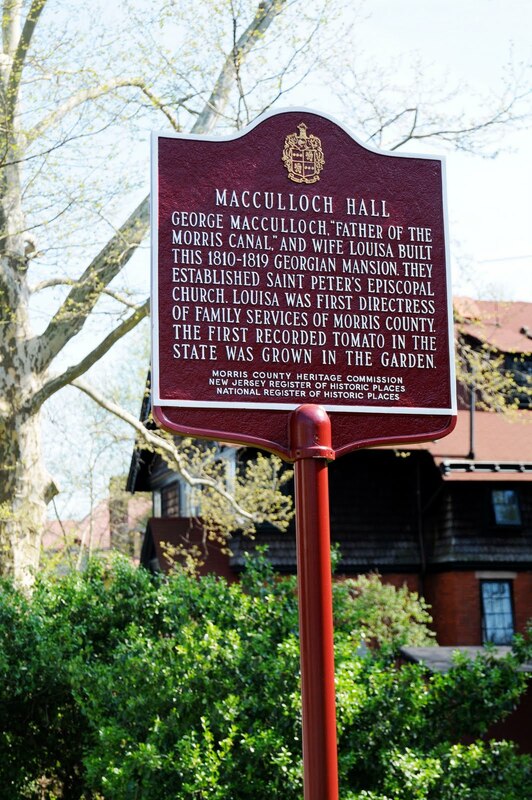 Last week I visited Macculloch Hall in Morristown, NJ. 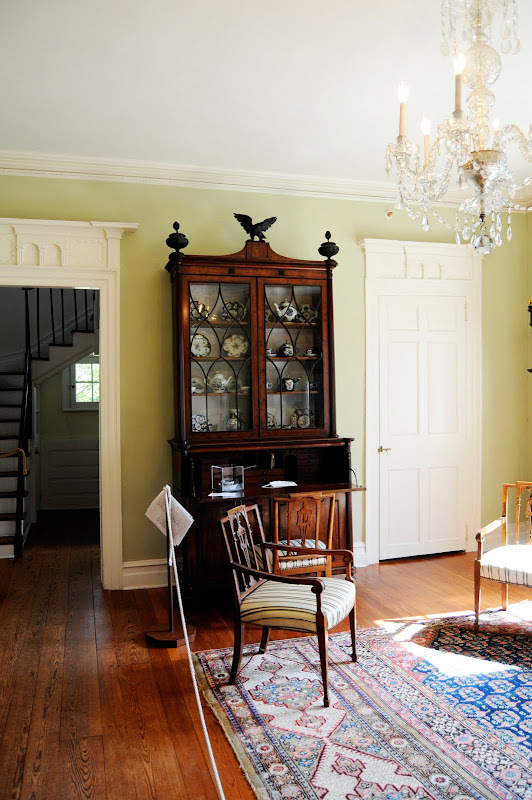 It houses a beautiful collection of 18th and early 19th century American and English furniture and decorative arts. 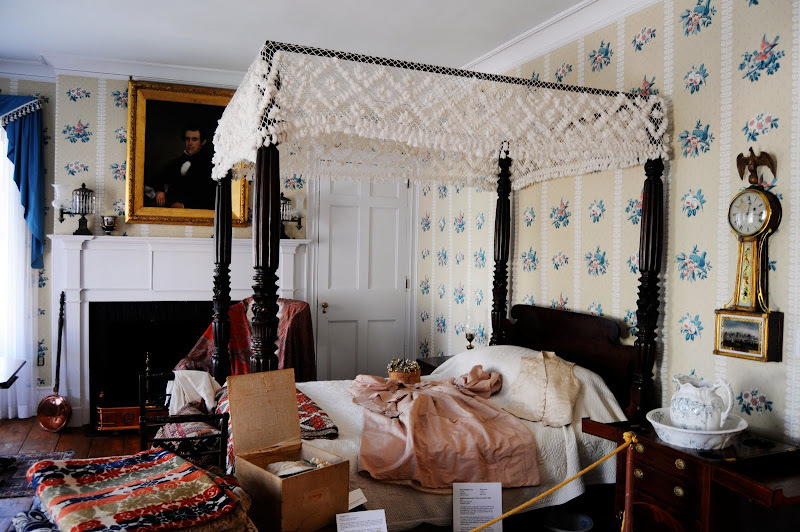 The museum is housed in a Federal-style brick mansion built by George Macculloch, a Scotsman who was born in India and emigrated to America in 1806. He was a businessman and visionary who is known as the "Father of the Morris Canal," which was known at the time as an international engineering marvel. Five generations of the family lived in the home. It was purchased by W. Parsons Todd, a local philanthropist, in 1949. He embarked upon a restoration of the house to contain his collection of furniture, decorative and fine arts from the 18th and early 19th centuries. 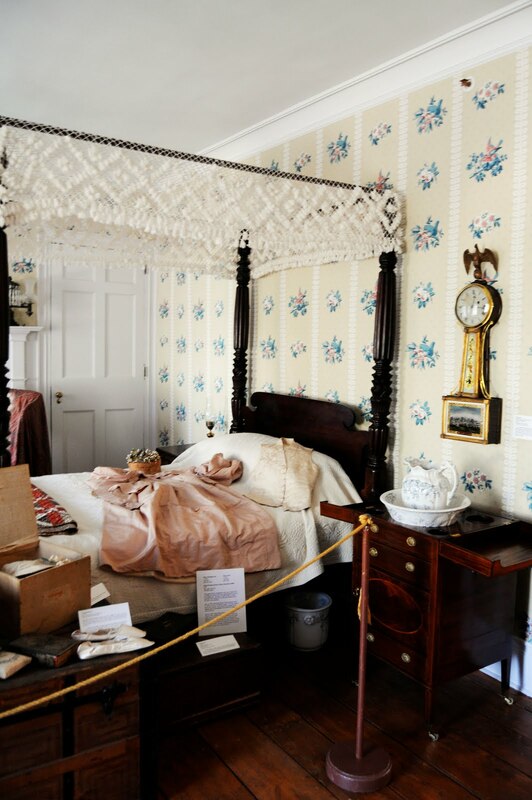 As you can see from the photos, the rooms are decorated to appear as a nineteenth-century home. While the furnishings are grand and elegant, they are combined with lamps, dishes, glassware and even toys from the period to create a feeling of casual family life. The rooms are large, light-filled and airy. 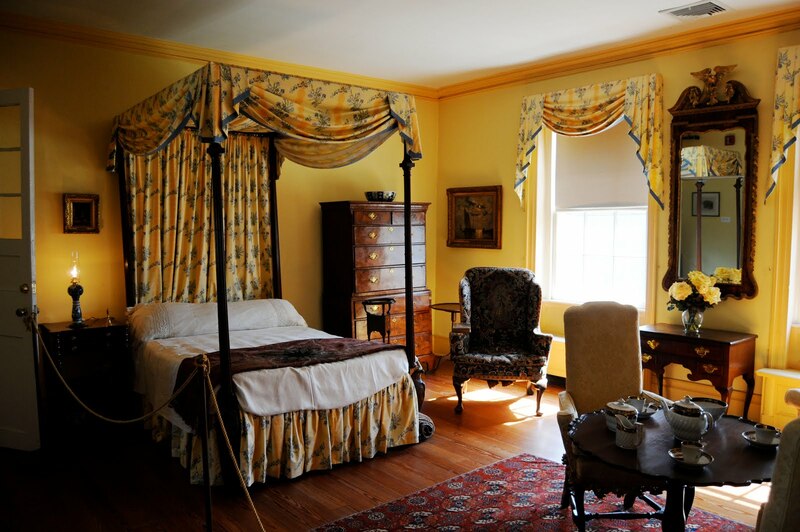 There are ten period rooms, including this beautiful yellow bedroom (above). 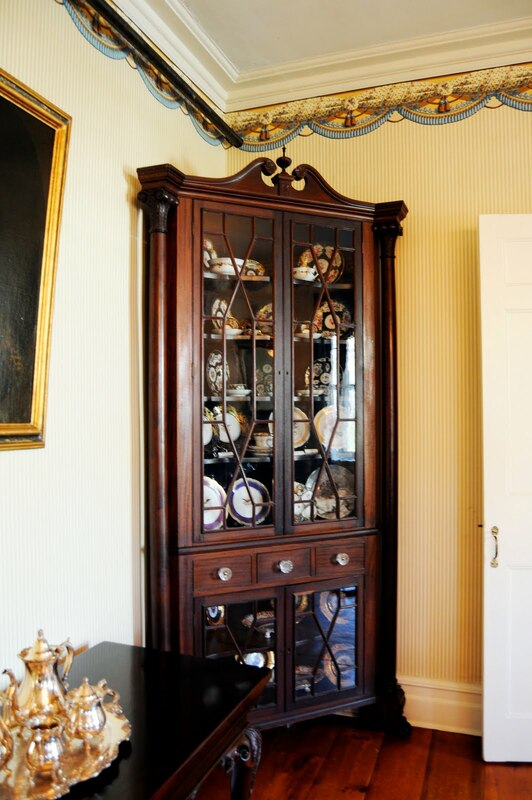 The formal dining room contains a fine collection of porcelain, crystal and silver, including several settings of American presidential china housed in this corner cabinet. 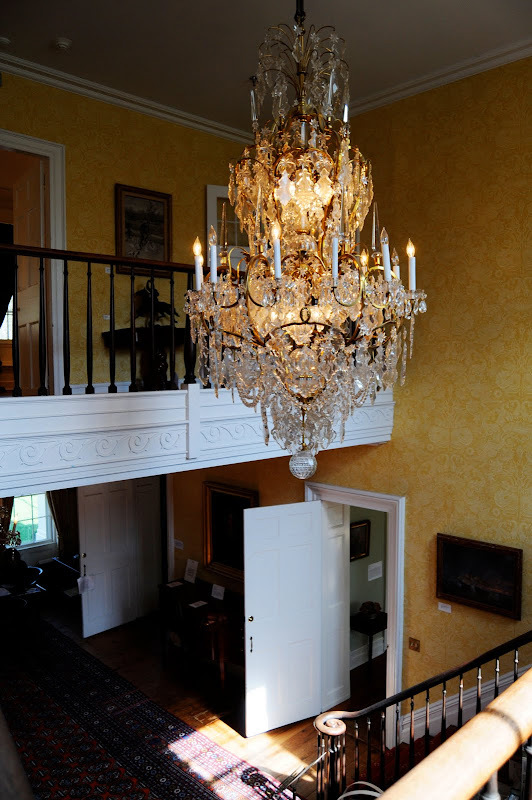 The central hall is graced by this beautiful chandelier (above), and a gracious curving staircase. 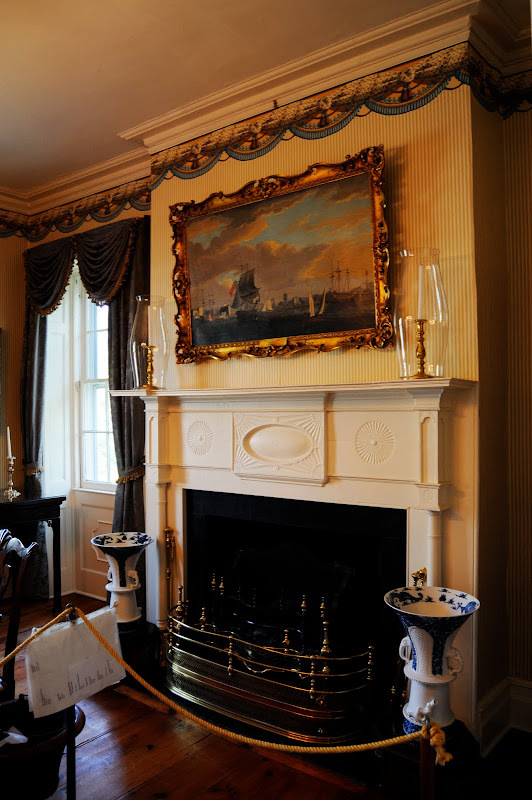 Here is another photo from the dining room (above), with beautiful hurricane lamps on the lovely formal mantel. 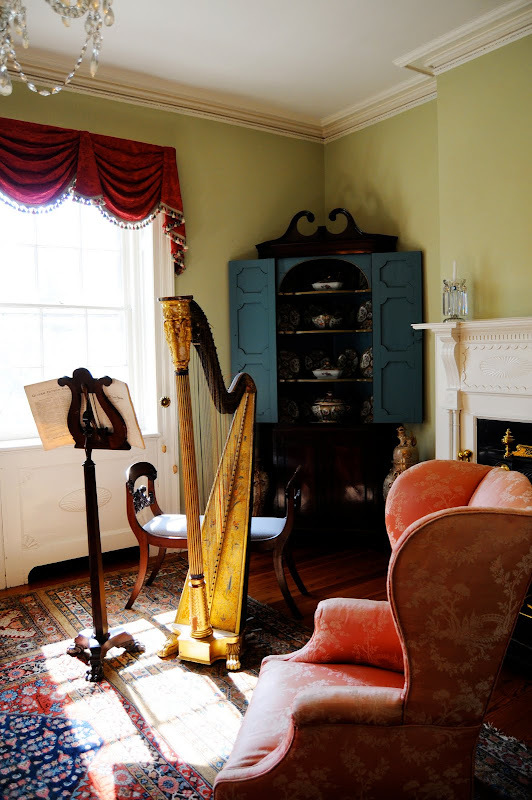 The beautiful parlor (above) is decorated as a gathering place for gracious nineteenth century entertaining, with comfortable chairs and musical instruments including a harp and a harpsichord. The fine china collection at Macculloch Hall includes examples of French, German, English and Chinese export porcelain from about 1750 to 1850. 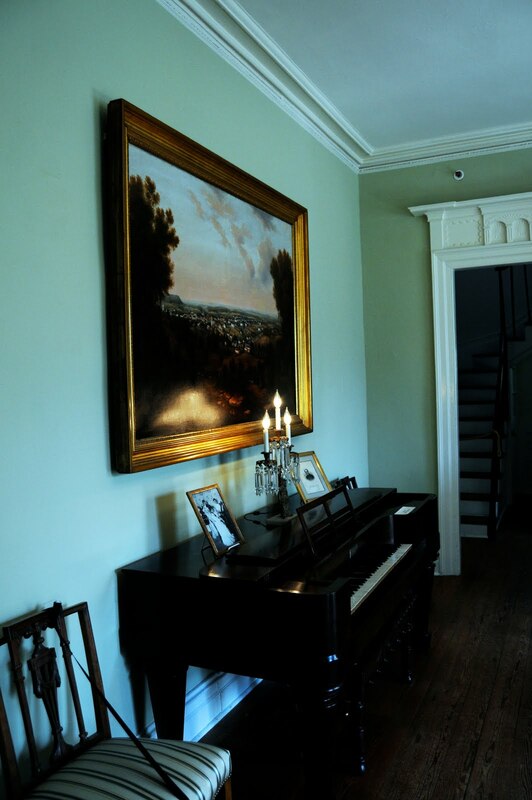 For more information about Macculloch Hall, visit their website. A very beautiful and interesting looking place! What a beautiful old mansion. Love the bed and the dress lying there. Looks like it was left there yesterday. Ooh la la! It's beautiful. I loved every room. But I think I liked the animals on the floor and the harp rooms the very best. Mary, Thank you for taking me on a field trip to the beautiful Macculloch Hall. So interesting. I am a great lover of yellow, so this house was singing to me! Especially that gorgeous yellow bedroom. WOW! 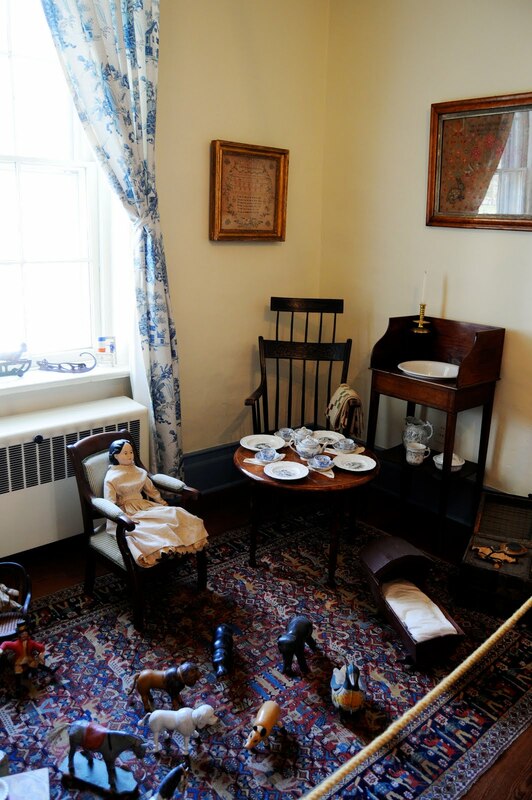 This home is so wonderfully restored and all the decor of the house so lovely and detailed. Thanks also for taking a picture of the sign in front of this landmark. I always do that too- there is such interesting info! Just lovely! And they grew the first Jersey Tomato!!!! This is a gorgeous mansion. Thank you for the photos and historical information. I love how everything is left about, toys, etc., as if the family just picked up and left for the day! Oh beautiful! We haven't visited this house yet; now it's on my list. I wonder how many "Morris Canal" markers are in Morris County? There was one at the end of the street where we used to live, and I recently found out the Canal ran right across the street from our current house. I can only think that from the apparently convoluted path the Canal took, that it was actually designed by Dr Seuss. Or, Mr MacCullough. I'm impressed by the tomato connection; if he's responsible for Jersey tomatoes, he's OK by me. What a gorgeous day! A wee bit chilly, but I'll take it. I so enjoyed the tour of this beautiful home and its furnishings! What a beautiful house, I always try to image what it would be like to live in a house during that period. I think I would miss somethings, but the pace of life would so much slower then our go,go,go society. Thank you for the tour. 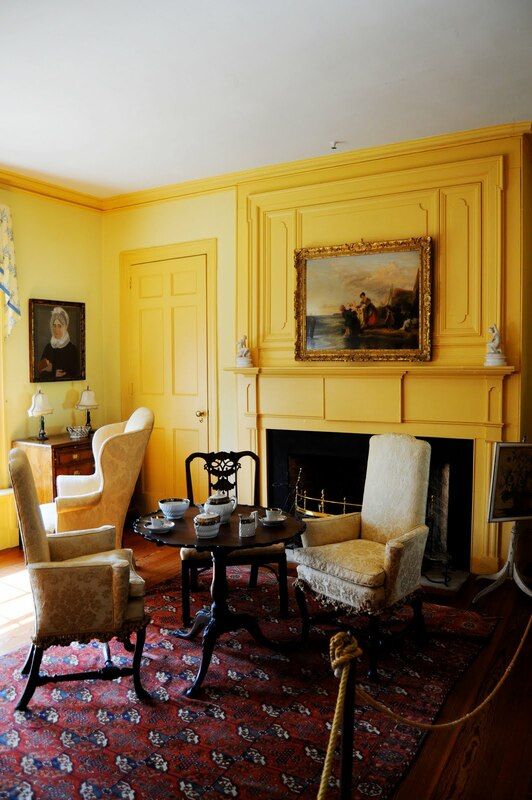 The colours in this house are beautiful - loved the yellows. I think I'd be very happy to wake up in that yellow bedroom. What wonderful photographs, each room is just grand! Lovely tour with fantastic photos! Yellow is my color and I love tomtoes...sounds like my kind of family. I really could be right at home there! Hi Mary- My fav photo is the one with the harp. I enjoyed my tour. Beautiful!!! I love to see old homes that are decorated period-appropriate! I wish I owned that house and everything in it! LOVE it! Thank you for that lovely tour. Now that we live in Idaho, we don't have those lovely historic homes to tour any longer. I miss it!! It is such a beautiful home. Love the harp. And the children's toys. Makes it seem lived in, rather than just museum like. Thanks for sharing that with us. Mary, I enjoyed this post where I could see this lovely place. Beautifully decorated!!! What a treat. That yellow room is something else! Gorgeous home. Thank you so much for sharing with us. Wow! What a beautiful home. The yellow bedroom is my favorite. I love seeing a bit of history, especially in homes...and how people truly lived. Very tasteful, elegant and yet warm and inviting. Oooo, I have goosebumps! I love it. I am totally in love with the yellows, I bet they were awesome in person. The chandelier...exquisite. Oh my heavens, Mary. What a graciously appointed home. It's so wonderful to see it so well-maintained and lovingly cared for. Such a beautiful collection. It's amazing how beautiful everything was, and yet it would be perfect for today's colonial. I love that border in the bedroom. A very interesting visit. thank you to share. Hello Mary, what a beautiful old home you visited. I love this era of furniture...such beautiful wood. And the floors...did you take a good look at those beautiful floors?!!! Gorgeous! I love that yellow bedroom too and the fabric. Thank you so much for sharing this with us...I appreciate it. Have a wonderful day! What a lovely home. I'm amazed at the intensity of color for the time. Thank you so much for showing us this special place. Mary, you are such a talented lady. Your photos...I stare and I absorb and in my mind and sometimes to myself, I let a "Wow" escape. I adore you photography. I think in all of blogland your photographs are my favorite.